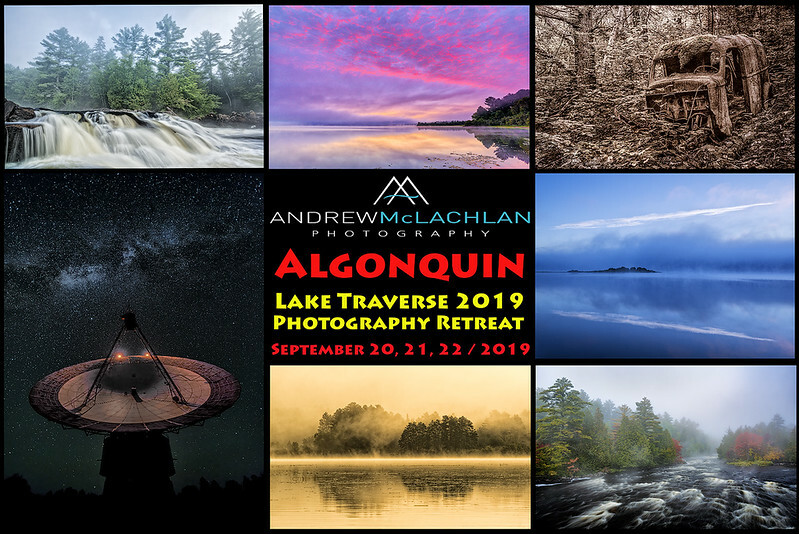 Join Andrew McLachlan for an exclusive, weekend workshop deep in the heart of Ontario’s Algonquin Provincial Park on scenic Lake Traverse for an opportunity to create stunning imagery from this remote, pristine landscape. This event will be held on September 20, 21, & 22, 2019. Lake Traverse is situated in a remote area of the park and is rich in both history and scenery. To reach this remote destination in Algonquin Provincial Park you must enter the park at the Sand Lake Gate. In the early 1900’s lumber baron J.R. Booth established a private lodge - The Booth Turtle Club on the shores of Lake Traverse. Today remnants of this lodge can be found in the woodlands such as impressive stone fireplaces and a rusted old wreck decaying in the forest. The timing of this event will allow for misty sunrises over Lake Traverse and assuming weather conditions co-operate we are in one of the best locations in all of Ontario to photograph the night sky and possibly the aurora borealis. Furthermore, we are situated a short walking distance from picturesque waterfalls on the Petawawa River. Our accommodations for this event will be at the Algonquin Radio Observatory, located on the shores of Lake Traverse. The Algonquin Radio Observatory is closed to the public and inaccessible. However, exclusive access has been granted to our workshop group for this event. A tour of the immense satellite has been arranged during the mid-day hours on Saturday, when lighting for photography is generally at its worst. Also available to participants is the use of canoes and kayaks during the mid-day hours to explore the lake on your own. The Algonquin Radio Observatory (ARO) is Canada’s national radio observatory featuring Canada's premiere Earth station facility. ARO is a division of space technology company Thoth Technology Inc. Completed and commissioned in the 1965, ARO’s 46m antenna is the largest antenna in Canada and one of the largest in North America. The observatory is situated on a 100 acre wild and breathtakingly beautiful site in the North of Algonquin Provincial Park on Lake Traverse, deep inside the park. The observatory hosts a suite of state-of-the-art scientific equipment including its own atomic clock and still operates with a state-of-the-art technical capability. ARO is the official ground station for Northern Light, Canada's mission to Mars. Morning photo session (6am – 10am) followed by breakfast. Checkout is at 11:00 a.m. however, participants are permitted to explore other areas of the park at their leisure for the remainder of the day. Do Note: Each location we will photograph at is a short walking distance from our home base at the Algonquin Radio Observatory. •	A 3 day, daily vehicle permit fee must be purchased at the Sand Lake Gate to enter the park. This vehicle permit will allow participants to remain in the park until 10:00 pm on Sunday. $585 plus taxes, per person, based on double occupancy. $625 plus taxes, per person, for single occupancy. A non-refundable retainer of $250 is due now to secure your spot in this workshop. Payments are accepted by cheque or e-mail transfer. The balance owing will be due no later than June 1, 2019. A Waiver of Liability will sent to registrants at the time of booking, to be returned with the non-refundable retainer. This workshop is open to a maximum of 15 participants (12 spots open). To reserve your spot in this exclusive workshop please contact me by clicking here. 61 days prior to the workshop date full refund less $250.00 non-refundable retainer.